We are excited to provide our guests with a holistic wellness experience at our salt cave. 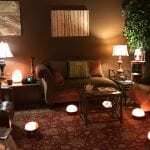 Himalayan Hideaway Salt Cave is a wellness zone, relaxation station and retail shop located in Winston-Salem, North Carolina. 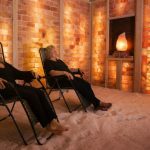 Our salt therapy ‘cave’ is the first of its kind in more than a 60+ mile radius, where this unique micro-climate offers a relief of symptoms related to allergies, bronchitis, COPD, arthritis and skin issues. During a 45-minute session, the salt cave will not only promote healing, but also create “down time” from the distractions of life, since no electronics are permitted. Customers can kick back and relax in a remote atmosphere with peace of mind and serenity. Himalayan Hideaway Salt Cave creates a truly unique experience because, in addition to the salt therapy experience, you’ll be enchanted by the colors and cultures of Nepal. Our retail shop offers an assortment of salt products, tea, and locally made goods. If you have questions about our services at Himalayan Hideaway Salt Cave or would like to stop by to try this unique healing experience, contact us today to learn more. We look forward to transporting you to wellness and relaxation! Chrissy was introduced to her first salt cave experience while looking for relief from an illness that doctors could not diagnose. Desperate to feel well, she began to try ‘less conventional’ means of wellness, and salt therapy was the only avenue that proved successful. She felt noticeable improvement from her symptoms, and therein began her investigation of what is known as salt therapy, also known as halotherapy. She looks forward to having the opportunity to help others with a holistic approach to wellness, offering the affordable, all natural, healing benefits of pure salt.